My UE40F6400 is controlled like a charm! I made a flow that mutes the TV when homey starts talking and unmutes it again after. Seems to work in 70% of the times. I might change that one to an IR command when it is stable. It would create a lot of extra cool possibilities! Would that be possible? And can we buy you a beer? Not supported. Samsung TVs now run on Tizen which is for now outside the scope of this app. Have you tried entering the tv IP manualy? It didnt find mine automatically as well. You can find it in the network connection menu of your tv. There is no other way to add your tv then adding you tv ipadress. Oops I was under the impression it was supposed to find a tv on the network and when it failed you could enter the ip manually. Hm.. 70% is not good enough . I used in the past in exactly for exactly the same flow, will re-enable that one to monitor it. Those cards would be nice, but I'm not sure if I can make them reliable. My TV cannot be reached until about 60s after I powered it on. But will try it soon. Although I usually don't say no to a beer, this is all just community lovings , lol. Could you add the UE40C5100 and UE37C6000. I would like to test you app on both of these. I am no programmer but would like to see the newer 2015+ J/K Tizen series supported. Maybe someone can indicate if it is doable or hard to build an app for Homey? No complaints anymore about that flow. Seems to run smooth now! A few days ago I saw that the app was chrashed and I restarted it. What can we do to give you more insight about what made it crash? That link is only about an on screen remote that can be used in apps that you install on your TV. Since I've no idea how these TV's work, I cannot indicate if it will easy to write an app for it. But you could always send me one of course, then I would be more than happy to take a look . 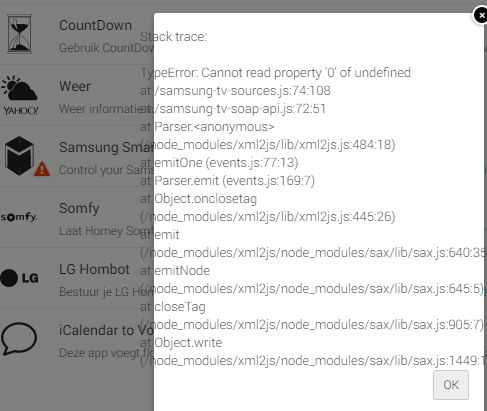 You can see 'the reason' (a stack trace) why it crashed when you go to Settings > Apps. In case it happens again please let me know, try to remember if there was a specific action you (or Homey) did to let it crash, and provide me some details on your TV. Do you see this constantly, or only some times? @casper I have a F6400 2013 model. 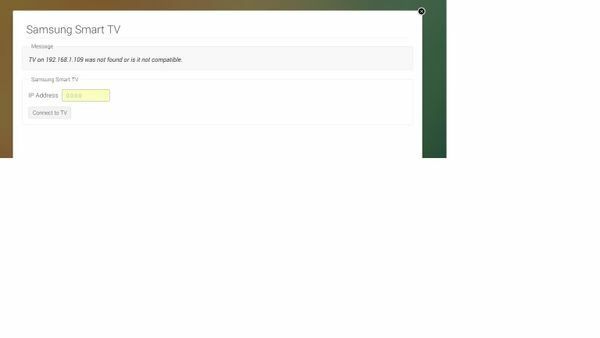 Dont know when it crashed, only that the app didnt work when it was suppositie to turn of the tv. Would be Nice if homey announced the crash of an app! For some reason the number of crashes increased hugely somewhere around 0.9.3 / 0.10.0. Could also be a coincidental increased number of installs of course. Seeing some stack traces similar to the ones in your images. Also getting a "missing_listener" warning since 0.10.0 when trying to edit source/channel flows. Will have to look into this. Btw, I have very little time to put into this app, please don't expect things to be fixed within a few days/weeks. If anyone likes to help, I'm very open to PRs on the app . @btwvince Bit confused by this "When I restart the app it goes away but when it does it's first action then i get the same message. ", since it only retrieves sources (the point where it fails according to the screenshots) when editing flows (for as far I remember). I would definitely wait for 0.10.1 before putting time in the stack-trace... Will probably be fixed too. 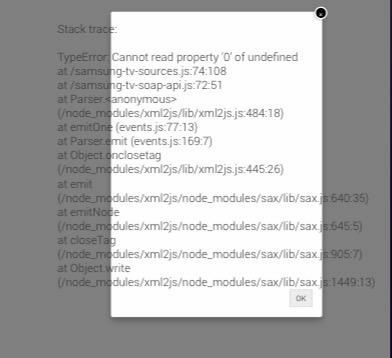 I tried the App today for the first time (0.10.1), paired with UE46F6510, but when using the cards "set TV to source" or "set TV to channel" an error message "select a tv" shows up. Am I doing something wrong? I also wonder why there is card for "power off" but none for "power on". This is either a bug in 0.10.1 or an API change. I had noticed it already, but haven't had time to look into it yet. The reason there's no power on is because the TV is not reachable before it's turned on. Therefore it's not possible to send that command. The option to turn your tv on is also not available in the official Samsung smartphone apps. Update that fixes the 'Select a TV' issue has been submitted for review. Should be available later this week. I add the Samsung TV and after that my flow can switch the tv off. 2bad that the app is not working right. An (probably successful) attempt to fix that has been submitted for review last Thursday, so will be available soon . Oops, at least now it is, forget to press the actual submit button.